Primitive and crude (often simplistic) categorizations of films by the pupils can be a powerful educational tool enhancing their argumentation and negotiation skills, essential for the development of critical thinking. Each time pupils watch a film or a film’s excerpt, it may be useful asking them to agree categorizing it in simple categories (e.g. silent – sound, color – BW, fiction – documentary, simple film technology – extravagant film technology etc) and to try to support their choice with an example. A template suggesting pairs of categories would be useful for the teacher. Comparing films that share one major common characteristic (e.g. 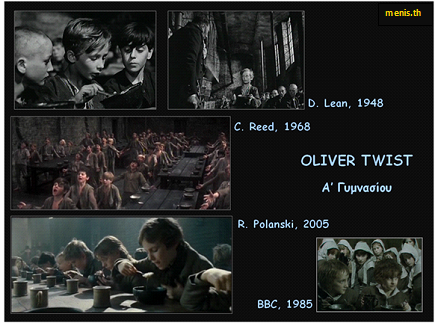 theme) made by different directors and representing a variety of film aesthetics (not only European), can reveal issues of film aesthetics beyond the common remarks of “what the story was about” to which the pupils usually focus. Do they tell similar stories? How do they differ? Can we describe our different impression for each one of them? 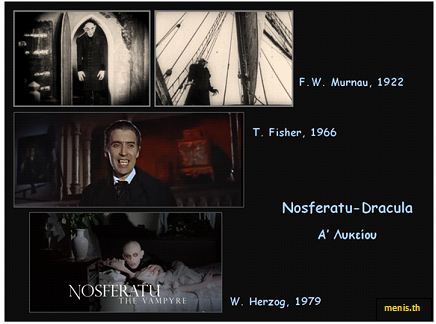 Through comparisons children will develop their own perspective of film history. 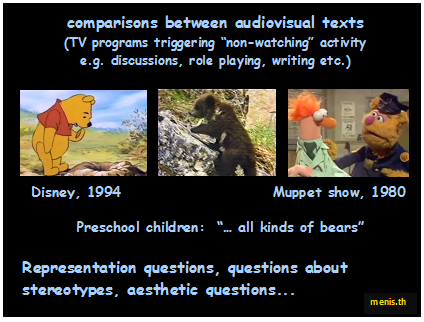 (Slides from PPT used in teacher training to encourage comparisons. The corresponding DVDs are easily accessible in the Internet or in DVD libraries). 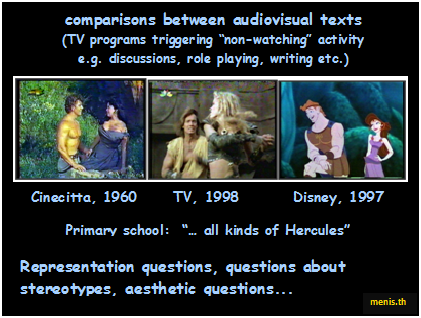 This entry was posted in Creative Europe Research, Greece and tagged Berlin october 2014, categorizing audiovisual texts, comparing audiovisual texts, Critical dimension, discussing audiovisual texts, film education, young audiences. Bookmark the permalink.